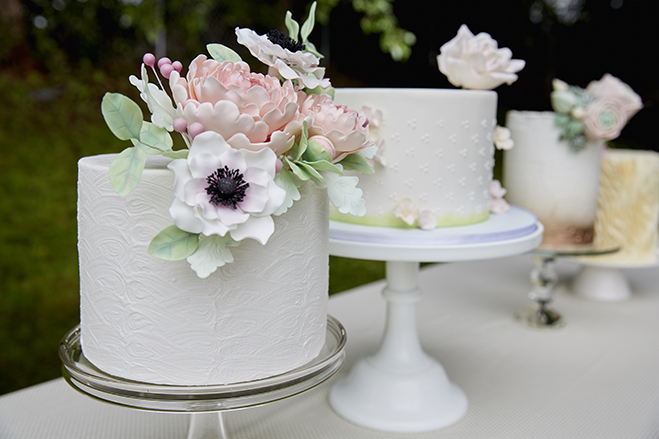 “We love creating flowers that are custom to the bride’s wedding aesthetic—something that resembles other floral they may be using that day,” says Lauren Potter, lead designer and assistant manager at Nadia Cakes. With a touch of rose gold and a crown of pastel pink blooms of gum paste and fondant, this cake boasts an effortlessly cool vibe for a breath of fresh spring air. This charming design from Sweet Retreat is both bucolic and luxurious, combining soft ruffles with rustic twine and floral detailing. “We wanted something that was light and airy-looking with the feeling of spring,” says designer Stephanie Kissner. The ruffles of Italian buttercream provide depth and movement on this one-tier treasure. And what sounds more delicious than Italian buttercream? 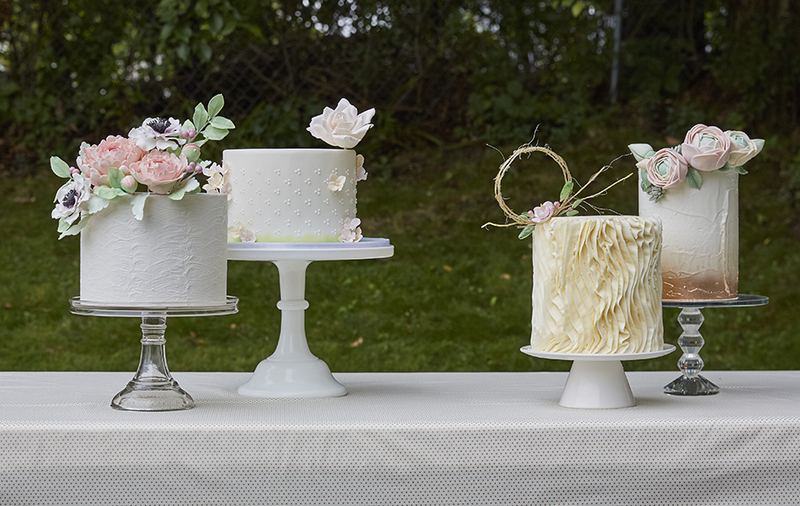 “This type of buttercream has a soft, silky texture that melts in your mouth,” says Kissner. We can’t wait. Nothing says chic quite like a minimal aesthetic, and on this stylish sweet from Enticing Icing, the exquisite lacy detailing and perfectly crafted flowers really come into their own. “Fun fact about sugar flowers: They’re extremely delicate and will shatter like glass if dropped,” says owner Heather Jurisch. Dripping with romance, it’s only natural that this sumptuous sweet would be the belle of any ball, outdone only by the bride herself.